My first Chelsea and I get gold, it doesn't get much better than this! I'm so proud of what we have achieved. I hope the high profile medal inspires more people to come to Yorkshire to see for themselves the landscape that brought gold to the garden. These are the words (as quoted by Martin Wainwright in the Guardian’s Northerner Blog) of Tracy Foster, the Leeds garden designer , who worked closely with the Parsonage while she was creating her gold-winning entry for this year’s Chelsea Flower Show. It also collected the People's Garden award. 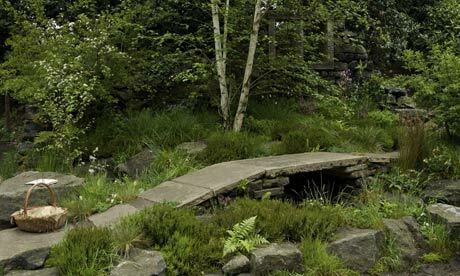 The materials for the Brontë Garden, which has had a non-stop stream of admirers since the Show opened, were sourced as far as possible from the area around Haworth, including boulders from Dove Stones Moor. Those Chelsea admirers who have actually visited Yorkshire and walked up to Top Withens will surely have recognized the little bridge of slabs across the beck near the Brontë Falls. And how many of those admirers know that the wonderful Yorkshire landscape which inspired the garden is now under threat from giant turbines, which will be visible for miles across the moors? Turbines can be beautiful, I hear some of their defenders claim, a monster-sized equivalent of windmills in the Netherlands.